We were sick and tired of being sick and tired. We were done with college, deep in debt, and not earning nearly as much income as we thought we would be. We felt like we were barely keeping our heads above water and living paycheck to paycheck like most Americans. We first heard about Dave Ramsey from a coworker of mine at the law firm I worked at in 2008. She let me borrow a copy of the book, "The Total Money Makeover" and it all started making sense. I had Nate read the book too. We eventually got our own copy of the book so we could make notes, re-read, and photo copy budget sheets to stay on track. This introduction was a good taste of what we needed to do but it took us several months to truly get fired up. Nate graduated in December 2008. Just as the economy was tanking. He looked for an engineering job in Colorado for 6 months when we finally decided to take a job offer in Maryland in early 2009. Once in Maryland we were earning a professional salary instead of being broke college students and it was time to get to work. I started a full-time nanny job about 5 months after we moved and we were a two income earner family for the first time ever. Dave Ramsey said you need to tell your money what to do. We started making a written budget but struggled with sticking with it. Every time we fell off the horse, we just got back on again. It was slow and steady progress. We tried the cash envelopes several times during our time in Maryland 2009-2011 but could never quite get it to work as it should. We started hammering away at our credit card debt, paying big chunks at a time. It felt good to not have that huge burden hanging over our heads. In 2011 Nate received a great job offer back in Colorado with a raise, in a city we thought could be our forever home. 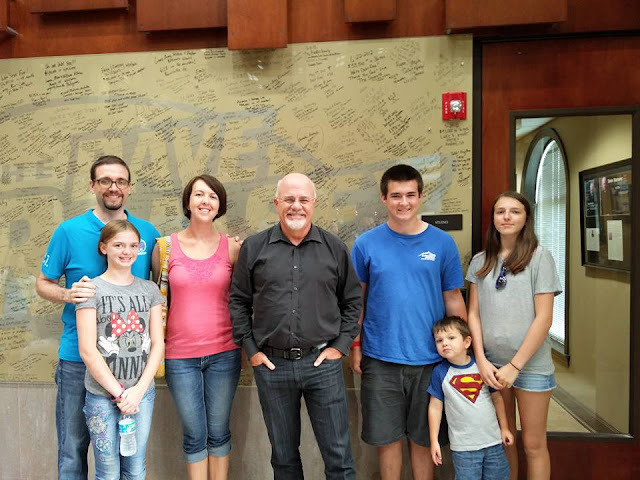 By the time we moved back to Colorado in June 2011 we had paid off $28,000 in credit card debt and $20,000 in car loans, $48,000 in loans in less than 3 years since we first heard about Dave Ramsey. All while not earning more than $80,000 combined income for our family of 5. Eliminating all debt except our student loans was an amazing relief and there truly is peace without that burden on your shoulders. I'd like to say we just kept at it and knocked out those $80,000 student loans right away but that's not our story. I had wanted a 4th child for many years and we had both agreed we would wait until Nate could advance his career and our finances were stable enough I could stay home full time until the baby was in kindergarten or 1st grade. Originally we thought we'd pay off all our student loans first. During a week long Yellowstone camping trip in July 2011 Nate said he didn't want to wait anymore, he was only getting older, and let's go for it. Needless to say, I got pregnant our first month trying and 9 months later we were blessed with our final addition to our family. I did stay home with Orion at first. While Nate received a raise we were without my income. We got lazy about budgeting and saving, busy focused on getting ready for the new baby and didn't make significant progress during late 2011 and early 2012. 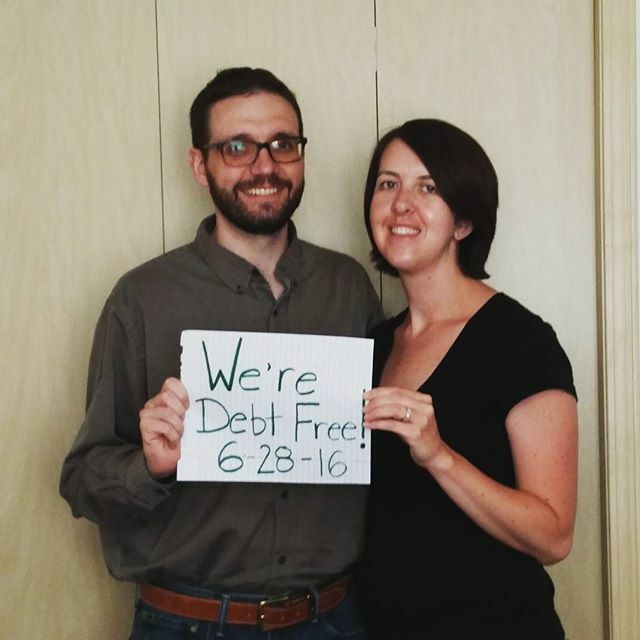 I went back to work full time in June 2013 and we started paying extra towards our debt. Essentially my entire income should have been going to student loans but it didn't work like that. We never were good about sticking to a written budget during this period and had a lot of two steps forward, one step back. We had a really good household income and were frustrated that we weren't making headway like we'd like to. We decided to take Dave Ramsey's Financial Peace University at our church fall of 2014. That was one of the best decisions we've ever made. The structure, discipline, and accountability of the class were keys to our success. We learned new things from the book and video but mostly from the facilitators and other classmates. We were determined to finish paying off the rest of our student loans ASAP. Some months we made thousand of dollars in extra payments, some months it was only $1200 or $1500 but we kept chugging along. We made goal boards for our bedroom and kept those goals within sight each day so we knew what we were working towards. Another thing that we took away from Financial Peace University was truly using the cash envelope system as designed. Cash hurts to pay with. You are handing away some of your hard earned money instead of mindlessly swiping your credit card. The thing with cash is when it is gone, it's gone. This was a huge wake up call to me. Especially in our spending money category. Nate and I started out with $40 per week each for coffee, treats, lunch out, or we could save it for something for ourselves. We soon realized our budget didn't have that much extra so we cut back to $20. Thinking through our purchases and stopping when money was out was an important thing to learn. We also used cash for groceries, restaurants, and entertainment. It was fun to stretch the budget and have money left over. June 2016 was another milestone for our family. Another big cross country move and another promotion for Nate. Our house in Colorado had gone up significantly in value and we were able to buy a new house with $85,000 or 25% down and keep our payment the same as well as take the rest of our equity and pay off the remaining balance on our student loans. It was an amazing feeling! We truly feel like it has been a marathon and a hard one at that but we have changed our family tree! Instead of living paycheck to paycheck, giving into instant gratification, we now can plan, save, and spend money on the things we want to enjoy. We are putting money away in retirement and want to start investing. We have a fully funded emergency fund and 20 year mortgage with a very low rate. Someday soon our mortgage will be paid off too and we will not owe anyone any money. Our way of thinking about money has changed. We won't finance anything again. If we need a new car and we don't have cash for what we want then we'll lower our standards. If we want to take a nice vacation, we'll save for it. It takes planning, effort, and discipline but most importantly I hope we are teaching our kids these lessons now so they can start their adult lives without the heartache and stress of digging out of significant debt. Just because everyone in America is doing it, it isn't right. You can save up for your purchases, you can get ahead, you can win with money, and you then can bless others with your money too. Visiting Ramsey Headquarters August 2016 on the way back from visiting family. We get to do our debt free scream live on air during the radio show 11/8 3-4pm CST! Michelle! This is so inspiring. I need this book. I want to do this like yesterday!!!!! !